Low surface temperature towel rails are perfect for family bathrooms and our Fina-E is an excellent choice with its timeless chrome finish and straight bar design. Restricted to a 43 °C surface temperature, it's also NHS compliant and can be used anywhere from care homes to cloakrooms. This sophisticated heater will provide you will luxuriantly warm towels as well as a practical place to store them away. Low surface temperature towel rails are a must for homes with small children or vulnerable adults and this version of the Ecostrad Fina-E provides a fully NHS compliant heating solution with its low 70w output. 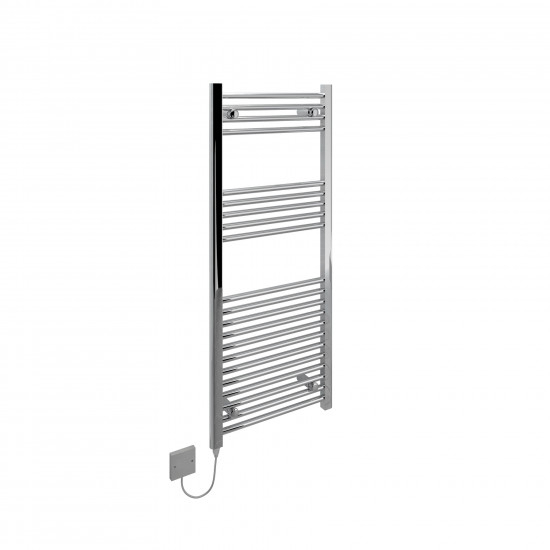 This sleek, chrome towel rail has a surface temperature limited to 43 °C to gently warm and dry towels whilst eliminating any accidental contact with a hot surface. The Fina-E is filled with heat-retentive thermal fluid that stays warmer for longer, which means that it uses less energy to maintain its heat levels. This version of the Fina-E comes with basic on/off control so you can use your electric towel rail on-demand whenever you want your towels to be invitingly heated.